(ada) The French league is over but hockey in France still goes on. At the end of the 2001 season, France will not only compete in Division 1, but it will be the host. Rouen experienced great success in the early 90s yet came to a downfall. As history repeats itself, Rouen is back on top once again. They allowed Anglet to score just one goal in three games in the finals. Rouen had been the first French team able to compete with the leading clubs of the continent in the early nineties. In this glorious era, they won five French titles and had some remarkable results in European competitions. But they paid the price and ran up enormous debts, and then went through years of financial modesty, and became a mid-table club. Everyone thought it would be the comeback year of the "Dragons" with their strong roster. They were placed under great pressure, but didn't allow the cup to grace of trophy cabinet of an alien club. Franck Pajonkowski led the team in bringing the trophy back to its true resting place for the sixth time. It is said the legendary #20 centre should retire after this last success. However, the title was shrouded in controversy - firstly, over salary cap infractions (players being paid partly by sponsors), and also disputes over officiating. Following the big Rouen-Reims match, Rouen president, Thierry Chaix, refused to pay the officials, questioning their abilities. The stripeys had already been on strike once this season with a dispute in the two first months of the season over salaries. The winner was expected, so surprises came from elsewhere - Grenoble and Anglet. After a season in Division 3, Grenoble had a tough start to the season. Journalists and fans already blamed Russian coach, Dimitri Fokine, for his strenuous training sessions. However, this proved useful as Grenoble went from strength to strength, with one goal defeats becoming wins by one goal. However, they continued to carry the burden of the points lost at the beginning of the season, and finished a disappointing sixth. Nevertheless, they were almost favourites against a lacking Amiens and reached the semifinals against Rouen. Their Clémenceau rink had become more and more like a fortress in its final days (Grenoble will play in a brand new rink next year thanks to the organization of Division 1 World Championships). Rouen lost twice in Grenoble in the semifinals, but home ice advantage proved enough to qualify. This time, it was Grenoble's turn to criticize the refereeing. The nervous winger, Christian Pouget, was thrown out of the fifth game when he tried to enforce his own brand of justice. Pouget is well-known in Rouen - he spent one year there and was expelled from the team because he called his team-mates "goats" during the championship final. However, he is a fantastic scorer and his arrival (from Chamonix, due to bankruptcy) at the end of the autumn helped Grenoble considerably. As mentioned before, the other surprise of the season was Anglet - the Basque club thrashed Angers and qualified for the first semifinal in its history. The federation then announced that Slovak player, Slavomir Vorobel, was suspended until December 31st for a high sticking infraction which injured Dominic Chiasson (Amiens) a few months earlier. A very late decision (usual in disciplinary cases in France), but it worked to Anglet's advantage, who could ice him against Angers. It wasn't the opinion of Anglet president, Alain Bedere, who asked his players to strike at the beginning of the first game of the semifinal against Reims. As a result, the first period ended 13-0, with the final score being 17-2. Many said Anglet deserved to lose and to endure severe punishments because they tarnished the reputation of French ice hockey and didn't respect Reims' spectators. But you can't force destiny. Anglet lost the two first legs, but reacted to grab the three remaining games, eliminate the defending champions and qualify for the final. They were too weak for Rouen (scoring just one goal in three games), but it had been a remarkable season. It wasn't the case for Angers, who couldn't reach the podium they expected, because of too many penalties (from players like Martineau and Dubé). More importantly, they still have to find a new goalie for the next season, as their excellent goaltender, Sylvain Rodrigue, is to return to his native Québec. Caen have also experienced a poor season with a lower budget. They hit rock bottom in the third game of the quarter final against Reims (1-10). It was said the Finnish players didn't play well in protest against the removal of player-coach, Kuusisto, from the bench. He was replaced by Rodolphe Garnier, who was forced to end his career because of a concussion a few months earlier. To conclude, I would like to tell you about next year's league, but we still don't how many teams will compete, and with which formula. But, as promised, it will be the last season this happens (isn't that what they said last year?!). (15-11-00 Jack Barron) Heikki Leime is to lead the French national team. Not an easy job for the Finnish coach, since he'll be the sixth man behind the bench in as many years. Could he be the long-term teambuilder France has been waiting for? The last person to coach the French national team for any length of time was Swede Kjell Larsson. Recruited in 1987, he led France to Pool A and to the Olympic quarter-finals in Albertville in 1992. His defensive hockey made for a solid team, but some said France needed to take more risks to progress any further. So Juhani Tamminen (now coach of Kärpät Oulu) was handed the baton. The style that Tamminen promoted, based on short shifts and very active play, enabled France to beat Germany, Switzerland and Canada in the World Championships, to reach the quarter-finals in 1995. A year later however France were almost back in Pool B, and only retained their position in top flight hockey through relegation games against Austria. All of a sudden, risk taking became old-fashioned. Young Canadian Dany Dubé, who cost half of what Tamminen did, tried to build a development program for French hockey at all levels. Tamminen's team was old, and Dubé thus managed to rejuvenate the team. Unfortunately, because the Fédération Française des Sports de Glace (French Ice Sports Federation) were having financial difficulties, Dubé was only able to coach the team for one year (the national team even had to do without a medical team at the World Championships), and this was why, the following year, the Federation employed a part-time coach. Herb Brooks (the new coach of the US team - again) had been scouting for Pittsburgh since the last time he was behind a bench, five years previously for the New Jersey Devils. Brooks was the US coach of the famous "Miracle on Ice" team at Lake Placid (1980), and was said to be as strict as a Marine in training. But the magic had gone: after failure at Nagano nobody heard from him and he had to be reminded that his contract included the run-up to the World Championships. In Switzerland France managed a historic win against the United States, but were outplayed by the host team and had to fight to retain their place in pool A that November. The next coach, Swede Mikael Lundström (who once during his career coached... Kuwait!) had only three months to prepare his team for the challenge of the World Championships. In the four-team group, France tied with Slovenia and were clearly beaten by Ukraine. Once more Pool B beckoned. But, by defeating Germany, France were, again, saved because the first two nations qualified. Three Championship game losses later, France was sent back to qualifications, and the scenario repeated itself. The next newcomer behind the bench was Stéphane Sabourin, a young and inexperienced Canadian who had spent a tough year in Viry-Essonne, grabbing only one win in a season full of dramatic injuries. Still, France were second out of the four-team group and retained their place in Pool A. They performed well in St Petersburg but were unlucky and were the last non-Japanese team. The miracles finally ran out, and France were eventually relegated to Pool B (now called Division I). Stéphane Sabourin, who had had a three-year contract in order to prepare for Salt Lake City, was dismissed, and Heikki Leime was brought in. Leime is fully aware of the situation and declared in Le Jounal du Hockey : "It's not good to remove the coach each year. That's not good at all ! That's why I'm surprised but also disappointed for my predecessor. It's sure it's part of the game but I hope they will give me a little more time." Nevertheless, we hope he can survive more than one year. France is the favourite in its Division I group, and should have no trouble qualifying for the Olympics at Klagenfurt in February. (22-09-00 ada) French league is coming up! It had many problems last year, it was full of bad jokes. The whole French hockey nation hopes it will be different this season. Read preview by Jack Barron. The main event of coming season will be the return of Grenoble into the Elite league. One year ago, the club was sent back to Division 3 - the lower national level - because of bankruptcy. The federation has in some way admitted this late decision was an error as it has reintegrated Grenoble into the top league. Grenoble spent one season thrashing all its lower level opponents and became, to the surprise of no one, the champion of Division 3. They should have been promoted into Nationale 2, but a new "reorganization" of the leagues took place. Chamonix (from Elite to Nationale 1) and Brest (from Nationale 1 to Nationale 2) were volunteers to make one step back and allowed Grenoble to find its place in Elite again. - Chamonix is the high-titled French club in any sport (30 times national champion). Recently, this Alpine club, where many Elite players have grown, had to suspend operations for one whole year after the rink suffered from a big flood in the town. It was hard to come back and financial problems are still not solved. They decided to go down a league, but pay the price for Brest attitude, which was one of the reasons for the aforementioned weird rule. - Brest was a young club in the early 90's when Briec Bounoure, a manager of the Doux group (leader in chicken industry in Europe), used this sponsoring to recruit top hockey players. The club was in Division 3. Four years later, he won the Elite league and played in the European Cup. The squad included many foreign players : Brest didn't respect the quota of imports as they knew they had the European Union law with them, so the rule was broken. A few days before Brest's second title, Bounoure announced he would drop his team into Division 3 to protest against the lack of medias and structures (which he was as responsible for as the others, since club directors managed the Elite league in those years). At the time, he told the Elite should include fewer clubs and be more elitist... Then Brest, three years in a row, became champion of Division 3, of Nationale 2 and then of Nationale 1, killing any suspense in those leagues. Instead of going up into the Elite league to finish in mid-table, Briec Bounoure said he wasn't being listened to when he demanded more geographical groups in Nationale 1 (to save money; Brest is waiting for a new rink), so Brest would drop down to Nationale 2 (which has exactly the same structure as Nationale 1 - one Northern group and one Southern group). Everybody thought it was only a provocative joke, but it wasn't the case. Brest would have a new easily won champion crown, but many clubs and fans were sick of this yoyo act, which brought trouble in all divisions and broke up the (weak) remaining credibility of French ice hockey. So the federation ruled - in its particular way. To be certain, the relegated teams would have rosters too strong for their competition and this situation could be unfair to the other clubs. But some remarked it would have been more simple to force them to stay in their division than to change the rules expressly to enable them to drop down to a lower league, only to then say they could play, but not win a championship! There would be "ghost teams", who can't compete like others, throughout the season in French rinks. This troubles don't concern directly the Elite league (for once !). One good decision was made: The Nationale 1 champion will be automatically promoted into the Elite league, which would avoid sterile, never-ending debates in the end of season to discuss the composition of the Elite. Stil,l the financial situation is not safe, and many clubs have large debts. So a salary cap of 3.5 million francs (500 000 euros) has been established, which means the level of play will be a little lower this year. - Consequently, defending champion Reims had lost its entire first line (Savoie-Briand-Paradis) to Augsburg in Germany. They have a rejuvenated team, with prospects Yven Sadoun (from Viry) and Vincent Bachet (from Caen). Local young players as Romain Carrara or Mikaël Brodin will also have more ice time. - The favourite of the league is Rouen, which has the most impressive and physical team, recruiting, for example, last year's top scorer, Finnish forward Juha Jokiharju (from Amiens). Already some voices told the wages can't be below the salary cap, but the club officials explained they managed to respect the mark by reducing the size of the squad - two players less than last year, the junior talents can fill the blanks if needed. The problem some fans noticed is that Rouen doesn't benefit from its good work in youth hockey - last year they won the national title in Cadet (Under 17) and Minime (Under 15). They often dismiss players after their junior years and these youngsters succeed in other clubs - as Stanislas Solaux in Anglet or Loïc Sadoun (Yven's elder brother) in Reims. - After a troubled year, Amiens is now ready to clinch the title again. The fans are expecting the "Gothiques" to be back on the front of the scene. Amiens was Junior champion last year and will include some good prospects in its team. - Angers is always discrete, but are financially sound. The main problem of the club is that half of the team used to be changed every year. Will they eventually find stability ? With Canadian Patrice Martineau, they also have the toughest guy of the League, and their results may depend on their aptitude to stay out of penalty box. Christian Elian, a French youngster who spent its junior years in Czech Republic, has come to Angers, and the team is expected to get at last in the semis, and may be even much better. - After an outstanding year (French Cup victory and championship final in only its second year in the Elite league), Caen has to reduce costs since his main sponsor, Bayer, has decided to support sailing instead. The best foreign players have gone, and reaching the semi-finals would already be considered as a success. One interesting thing is that goalie Rémi Caillou will be given a chance to be a number one. Usually there are too few French goalies in the Elite league. - One other goalie to come into the Elite is national team player Patrick Rolland (who plays last year in World Championships and in Nationale 1 - French second level - with Villard-de-Lans), which comes in Grenoble. The club has a lot of anticipation for his comeback, but the expectations of the fans have been a little frozen by the preseason games. The effort to get back on the top of the table will be an interesting challenge. - On Anglet's beach, the mirage of a hockey Eden has disappeared. The debts have been deleted, the status of the club has changed, but, contrary to Grenoble last year, they could remain in Elite. They know they are lucky, but what is strange is that they'll have a higher budget than last year although they filed for bankruptcy. The Basque team has surfed upon big waves in heavy tempest, and deserves a period of calm. Only one player is coming, Antoine Amsellem (photo) from Rouen. - We still don't know if another miracle will take place in Lyon, which is very close to the abyss. Their first game against Grenoble could also be the last if the Urban Community of the city doesn't sign a check before September 25th. Announcing high budgets which only existed in his dreams, President Christophe Geoffroy has become a specialist in recruiting cheap East European players and firing them within a few months. Even if the club survives, the confidence of the fans and of the players will hard to re-gain. - With a low budget, Viry, with a new Yugoslav coach, still relies on young players. Some have gone, but two junior players come from Rouen and the junior team is still well-furnished. They could keep some key players: Canadian goalie Stéphane Ménard, defenceman Frédéric Brodin and forward Sébastien Roger. Nine teams are on the starting blocks to begin the season. Unfortunately no one can say how many will remain alive next year - or even next week. There are also problems with referees: first, they want their trip to be paid more because of the rise in oil prices. Second, the status of their union has changed and some questions are no solved about their licenses. In the two first playing days of the league, games have been called by players chosen by clubs, as all referees are on strike. PS : Lyon's expected bankruptcy took place on Monday, September 25. Players try to find shelters. International Roger Dubé, famous for being bad-tempered as well as for his slapshot, joins Angers, which becomes more and more an outsider, and Cyril Trabichet has been welcomed by Viry. Other players are expected to find a club in Nationale 1, except junior players, who will remain with Lyon's junior élite team. (04-07-00 xRadis) Jack Barron wrote a very long view at the last strange season of French hockey. Part TWO : The international scene (national team, French clubs in the European Hockey League) and French cup. Season 1999/2000 has seen the tightest Elite league ever, but the future of this league has never been so uncertain. The National team performed well in the world championships, but was relegated into the world's second level. All began like a dream with the good news delivered during the summer: first, the French Cup would be organized again (it was abandoned seven years ago). Clubs from the Elite league and from the Nationale 1 (the second level) could match up again. Soon a real championship would be reorganized with promotions and relegations. Second, the points won during the first round of the Elite league wouldn't be erased, as it was done during previous years, making the clubs wait until the end of Autumn to recruit some players. Third, a council was created in order to prevent financial troubles which hammered all previous champions and caused a lot of liquidations. Fourth, a national junior league would be created (instead of a northern group and a southern group). The last team would try to keep its seat in a play-out against the winner of the "Junior Excellence" champion (indeed national play-offs had been organized for a couple of years at the lower level, and could suddenly be useful). Observers of French ice hockey believed such fair decisions and reasonable attitude couldn't last. They were not too pessimistic, as further events proved. Instead of beginning its work with dialogue and long-term projects, the financial committee opted for spectacular repression and decided that Grenoble (champion in 1998) would be sent to the lowest level. The players became unemployed only some weeks before the beginning of the championship and the alpine club spent a year playing against regional sides, which were furious to be the victims of the inconsistency of the Elite, which disturbed their championship. Grenoble naturally won the Division 3. In fact, the quarrels between Grenoble president, Jean-Jacques Bellet, and the president of the ice sports federation, Didier Gailhaguet, counted a lot in the decision to dump Grenoble. But Mr Gailhaguet found a crazier thing to do; replace Grenoble by the Italian club Milan !! In the conflict between Milan and the clubs from Alto Adige *) resulted in a clash and Milan wanted to leave an Italian championship with eighteen clubs (as all Italian clubs escaped from Italian Elite to take part in the A2 league, where only one foreign player was authorized) and found a refuge in the other side of the Alps. Milan would take part in the French league but couldn't obviously become French champion as it was Italian. Already people imagined a final in which the loser would be crowned champion. In time the sports ministry reacted was too late, only one week before the beginning of the championship. An emergency solution was found; Milan games would count only for a "French/Italian championship". *) Alto Adige is a region at the north of Italy, where people spek mostly German and often consider themselves as Austrians. Most of Italian clubs come from this region. They promote local players, while Milan for example try to build a team with foreigners. In June 1999, it was said there would be a first division (serie A1) with as many foreigners as possible and a second one (A2) with only one by team. All clubs from Alto Adige decided to retire into A2. There were only four clubs in A1, so it was decided to make an amateur "Elite" league with 18 clubs. So Milan went away. Then, the first day of the championship was delayed by a severe control committee, as half of the clubs didn't show all financial guaranties. Some days later, the situation hadn't changed, the required papers weren't delivered to the committee, and the championship began... with the second day. French federation could take part in a competition of absurdity. The good idea (controlling financial drifts) resulted in a failure, because the committee was too ambitious: it hoped it could alter bad habits taken for many years in only one summer, instead of beginning a deep, long-term work. Long-term work is what the French national team really needed. But, for the fourth consecutive summer, its coach was replaced. Swedish Mikael Lundström was fired and, a month later, the name of his successor was unveiled - young Stéphane Sabourin, a Canadian which coached Viry-Essonne the year before. He got a promise; he had a three-year contract which could enable him to make a long-term effort with one ambitious goal - to reach the quarter-finals in the Salt Lake City Olympic Games. He had to play in a remake of "Mission Impossible"; he had only two months to maintain France in Pool A. To assist him, he had manager Nano Pourtier, a miracle-man who led the French acrobatic skiing team to Olympic medals and even the bobsleigh team to an incredible world champion title. To help the duo, the federation offered them an outstanding preparation program. International games? Not really, matches against Amiens and Rouen would be a little like family meetings. The game against Amiens was even cancelled. In November, after two games against a Canadian team, he could nevertheless gather a rejuvenated French team which kept his seat in the top flight in a tournament against Norway, Italy and Denmark. (It's the qualification for Pool-A tournament, which took place in Amiens in November. Italy and France retained their place, third-placed Norway too but after a decisive game against Great Britain, third from the other group.) In February, he avoided a dangerous trap to continue on his way to Salt Lake City. France defeated Poland despite the support of Gdansk rink, and remained alive and victorious after a rough game against Great Britain, which accumulated 88 penalty minutes. Philippe Bozon had his arch of the eyebows split by a British high stick and Gérard Guennelon was more seriously injured. 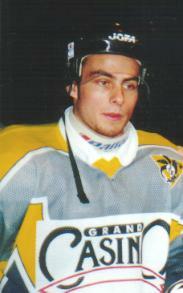 If Amiens had a new poor EHL campaign, one French club had success on the continental scene. Reims defeated Essen and Milan in Italy in the Continental Cup, and in the following round won in Ambri-Piotta against the host club which was the holder of the title. Reims had a draw against ex-EHL winner Feldkirch, but was beaten by a physical Ljubljana team the last day, which permited Ambri-Piotta to reach the final round and eventually win the Continental Cup. The French Cup gave fresh air to ice hockey and enabled some feasts in Nationale 1 clubs which hosted a game. Thanks to it, Caen, for his second season since its return into the Elite, won its first major title. Everyone wanted it to be better structured and wished Nationale 2 clubs could also take part in it. It was all the more disappointing when it was announced at the end of the season that the Cup disappeared, as Elite clubs tried to spare games in the chaos of the end of season. Before the play-offs started the final tournament of the French-Italian championshiphad been played. The regular season had been easily dominated by Milan. But some clubs, especially Reims, didn't respect the competition by sending a junior team in Italy, and Amiens allegedly lost on purpose its last championship game in Angers to avoid playing the final tournament, as they feared some players could be hurt before the play-offs. There was a controversy about Milan physical play. Nevertheless, Milan fans could watch a very good final tournament during two days and a half. Rouen unexpectedly defeated Milan the first day (4-1), but, as Reims beat Rouen 5-2, Milan could still clinch the trophy in case of a four-goal win against Reims. But tension was too big between the two clubs. Esposito threw the puck on purpose on Paradis during the warmup. After only 22 seconds in the game, during a face-off after a goal, Esposito attacked Paradis with his stick. (According to Milan fans, it seems that Paradis first discretely hit the Italian player). Ribanelli tried to intervene to separate the players, but Peca fought with him. Both finished with a bloody face. What was astounding was the completely passive attitude of the Italian referees, who let the fight go on, though they had many occasions to stop it. There was a massive fight involving all players plus Reims coach Jari Gronstrand (This point was emphasized by Italian fans, but the Finnish coach said that he just tried to protect the players, and that Ribanelli was being lynched). After the fight, Gronstand spoke with Rouen coach Guy Fournier and with officials of the Italian federation, and decided to leave the ice to avoid further danger. According to Reims, Milan coach told his players that Reims best players (Paradis, Laksola, Zwikel and goalie Pietila) shouldn't finish the game. Reims players barricaded themselves in the locker room as some Milan fans tried to break open the door. They were escorted by the police to their bus while 300 "tifosi" threw stones at them. The windscreen was smashed and the driver had a minor injury. In order to avoid Milan supporters, Reims bus went back via Switzerland. As Reims forfeited they had a penalty point and Rouen has won the tournament thanks to their win against Milan. It's the worst event in French hockey for years. Italy had already had some similar problems (Milan - Bolzano, championship final 1996). It is a final sad note for a stupid tournament, which meant nothing. It is time to support real European competitions, parallel to national leagues but the IIHF demise concerning cancellation of the EHL does not announce an optimistic future. Unless Milan is teleported in France or Switzerland, Milan had logically to try to find an agreement with other Italian clubs if they want to join a national championship. Fortunately that was done at the end of the season despite their quarrels. The Elite league was more tight than ever and the season was breath-taking as there were many leaders. Anglet briefly got the lead, Rouen took the first place during most of the season, and the duel against Normandy rivals, Caen, was uncertain. But, eventually, Reims won the sprint and was the final leader, and began the play-offs as favourites. The last place in play-offs was harshly coveted by Chamonix and Viry-Essonne. But the latter lose some games with a contested refereeing - even by their winning opponents! - and Chamonix went into the quarter-finals. It was a reward as they had to struggle when international goalie Fabrice Lhenry was injured, missing the competition for two months. The beginning of the play-offs was a little disappointing compared with a very tight regular season. Three of the quarter-final ties in the French Elite League play-offs resulted in three-game sweeps with only Amiens being taken to four games in overcoming Angers. But the suspense returned for the semis. Defending champion Amiens faced Reims in a repeat of last year's final while Rouen and Caen renewed hostilities after the final of the French Cup won by the latter. French international Arnaud Briand was outstanding as Reims opened their semi-final encounter against Amiens with an 8-0 victory. Amiens recovered their composure for the second game, also in Reims,and hit back with a 4-3 overtime victory. Reims won 4-2 a very poor third game with both teams losing a Finnish import. Amiens lost forward Juka Jokiharju (the best scorer in regular season) because of a concussion after a rough check while Reims lost defenseman Pekka Laksola on a match penalty. Reims was very close to the final the next day when they led 3-2 in the last minute of the game. But as Amiens goalie Antoine Mindjimba left his net to create a powerplay, Heikki Riihijärvi scored the equalizer only thirty-three seconds from the end. Amiens eventually won the match 2-0 on penalties. But Arnaud Briand scored four goals in the decider (6-2) to open the road to the final for Reims. Amiens couldn't keep its title. The club were desperate to save money to ease cash flow problems and seven players (Pousse, Lecomte, Duclos, Gras, Dewolf, Moyon and Riihijärvi) had been advised they will not be retained for next season. The players were upset at head coach Antoine Richer (World recordman of national selections who played 386 times with the French team) accusing him of siding with management against the players. It's not the best atmosphere to play the semi-finals. It was told later that Juka Jokiharju who said his career was probably over had in fact a diplomatic injury due to his stormy relationship with Richer. Home ice advantage proved more decisive in the other semi-finals with Caen winning the first two games. But Rouen had been unbeaten at home this season and proved it once more in the third game. They led 3-0 only for Caen to roar back and force overtime. Rouen maintained their terrific home record with young national team player Guillaume Besse grabbing the game-winning goal. Rouen won the fourth game on the same score (4-3 OT) thanks to an overtime goal by Nokkosmaki. But they needed an away win to get back into the final as in their glorious years. Finnish goalie Juha Virenius was great in the decider and Caen won only in penalty shots with goals of Provencher, Ollila and Lahtinen. The final could not be so breathtaking as it was played in only home and away games. That was a compromise to sell the games to national TV but the final was in the end broadcast by cable TV as last year but with only one game to show. Indeed the first game was even not broadcast as the Caen replacement rink (the normal one has been renovated) was not adapted. Indeed Caen town council did not authorize the game to be played in Rouen or elsewhere as they explained they put a lot of money in this replacement rink (nicknamed the "shed" by visitors). Reims became French champion for the first time by beating Caen in two legs (3-1 in Caen and 0-1 at home). It's a fair reward for a club which has been in the Elite League for ten years and which failed to gain this title only in final last year against Amiens. The last games of the season and the final could take place in a full rink. The crowd had been limited for two years to 500 spectators because a safety committee judged the refrigeration system was too old and dangerous. Last year Reims had to play many games in Épinal and the reopening of the rink was only partial. The post-season froze many hopes. After a lot of meetings to decide of the future of all leagues (where Briec Bounoure, Brest president, former upholder of a ultra-elitist professionnal championship, suggested an amateur first division with not less than 24 clubs(!) (in order to reduce travel costs), the best clubs from Nationale 1 refused to join the Elite as they fear financial problems. Indeed Anglet had a 500 000 euros debt, Amiens and Lyon were supervised by justice, Chamonix wanted to make one step down... Consequently it was decided not to decide. The Elite would go on with the same clubs and,next year the same debates will take place again to find urgently a formula with no clear long-term projects. And the junior championship? A disaster. Some clubs preferred to keep their young players for senior games and delayed the games. Some of them were never played. Were they forfeited or not ? Nobody knows as the federation never delivered any final ranking or information. Amiens won the league and Viry was second. Or may be Grenoble... Nobody knows. The season (16 games) was far too short and only suits the players who also played with their first team. The organization of relegation or promotion with the "Junior Excellence" winners ? Did anyone say that ? He has probably forgotten, nothing has been organized. Neither the federation, nor certain clubs seem to consider this championship as a valuable league. This confusion perfectly reflects the situation of the Elite. But their group for next year - Denmark, Poland, Netherlands, Hungary and Lithuania (all played at home) means they can come back into Pool A soon.